Without Jump Gate Omega, the Terran Commonwealth may not survive. In trouble far from Terra, facing trial in an alien court? Welcome aboard the starship Patrick Henry, refurbished pleasure ship converted into a flying law office building, with former holographic prostitutes re-purposed as crew and legal staff. If the new Matthews Corporation Jump Gate fails to span 2.5 million light years to the Andromeda galaxy, the heavily invested star-faring civilization of the Milky Way will face economic ruin and brutal war. 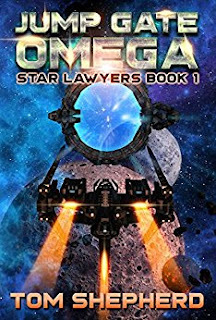 The Star Lawyers must run a gauntlet to the Rim, dodging pirates, politicians, prelates, and predatory star nations intent on seizing the new Gate to Andromeda.